Tomiki was born in March1900 in Kakunodate, Akita Prefecture and started Judo at the age of 10. He was a highly regarded Judo player at Waseda University where he entered in 1922. He gained his 4th Dan in 1925 and 5th Dan in 1928. Being so talented and obviously involved in the Kodokan (Judo's headquarters and the mecca for Judo students from all over the world), he was asked by Jigoro Kano (founder of Judo) to study Aikido under Morihei Ueshiba, which he did from 1926. Through his study under Ueshiba Tomiki attained the rank of 8th Dan Aikido in 1940 from O'Sensei himself. He was the first disciple of O'Sensei to do so. Before this Tomiki was sent to China around 1936 at Ueshiba's recommendation to teach Aikido at the Kengoku University in Japanese occupied Manchuria. Tomiki was captured at the end of World War II and interned in a USSR detention camp for three years. It was during this time, in the confined space of his cell, that he distilled his knowledge of Aikido and Judo and devised the unsoku undo and tandoku undo exercises. His budo training helped him to survive and keep fit, returning to Japan in 1948. In 1953 Tomiki went to the USA to teach Judo and Aikido. In 1958, as a professor of Waseda University, he founded the Waseda Aikido Club. It was during this period that he really developed his system of Aikido. He saw that Aikido taught in the conventional way of kata had no objective measure of power such as in Judo and Kendo. This, he felt, reflected the inadequacies of teaching methods and thus he devised a randori training system in which he combined his knowledge of Judo and Aikido to bring out the best in each. Initially, his ideas were not well received by Ueshiba or the Kodokan (the world Judo headquarters), for whom he had developed the KODOKAN GOSHINJUTSU KATA. However, he was also very fortunate in having with him a devoted friend, Hideo Ohba, from the same prefecture, who also studied under Ueshiba during that same period. Hideo Ohba 9th Dan Aikido, was also a keen Judo exponent (6th Dan) and studied Kendo (4th Dan), Naginatado (3rd Dan) and also Iaido, Jukendo and Kyudo. Therefore, Tomiki was able to enlarge his theory of randori, often demonstrating with his friend Ohba, to other budoka his 15-technique Randori-no-kata (it later became 17) which was derived from Aikido and other Jutsu. Today we know it as the Junana-hon-no-kata (Basic 17). 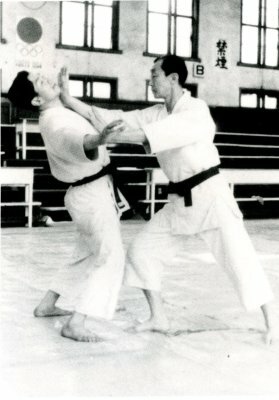 He was most ably assisted in the propagation of his theories by Hideo Ohba, who experimented with various methods and also grouped a number of traditional Aikido techniques into six Koryu no kata. Tomiki has often been misunderstood, especially by those who wish to stay in their own ordered way of practising Aikido. Such critics are right in their belief that there can be no competition in Aikido if one is to remember the principle of harmony with one's opponent. However, as the majority of students started Aikido with the idea of self defence, especially in this modern world of violence, there was no objective yardstick by which one could measure progress in oneself. Apart from the formal gradings conducted by one's teacher, or organisation one could go on believing in one's ability within the structured kata practise of the dojo. 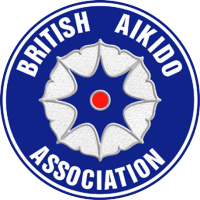 Tomiki believed that Aikido was so valuable that he wanted to spread it as quickly and as widely as possible, particularly among the younger generation because it would be from them that the future of Aikido would progress. Although it is true that one can start Aikido at any age, it would be foolish to expect someone starting older in life to attain the same level of proficiency as a younger person within the same practice period. The earlier one started, the more knowledge acquired and perhaps wisdom as the time of pratise lengthened.